A lengthy introduction is hardly needed for the man widely regarded as the most talented keyboard player alive. 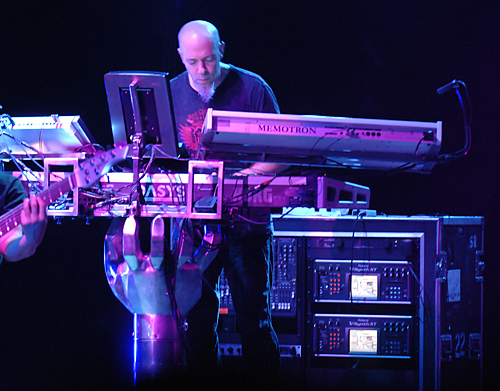 Jordan Rudess is best known to the public for the wicked keyboard chops he lends to progressive metal band Dream Theater, and his talents have also been displayed on multiple instrumental solo records bearing his name. His fingers have graced countless recordings for other artists, as well. With the release of Notes on a Dream, Jordan Rudess takes classical piano to another level, reinterpreting popular Dream Theater songs as instrumental piano works. We sat down with Jordan to talk about the new solo record (and more) just days before Dream Theater headed to Europe to begin their 2009 world tour in support of the new CD, Black Clouds & Silver Linings. MPc: Let’s talk about Notes on a Dream. This piano album is really incredible. When do you think you’ll get around to playing Carnegie Hall? MPc: Yeah, just a little bit. Tell us about your motivation for creating this album. So I started to plan the whole thing, and the big planning part was: what’s the direction? There’s a part of my piano style that’s very fluid and improvisatory, and that part, of course, lends itself more towards the ballads, which is the direction I kind of went in. The other part of my playing is very progressive and could be very rhythmical and more involved with the rock side. And I can do that on the piano as well. But after a lot of thinking I decided, you know what? If I do this again, I’ll do a second album of piano covers. I would do a progressive version of this. But the way that it turned out, I decided, I’ll do the ballads. I’ll take these really beautiful melodies that I think are great — that a lot of people don’t even get to hear, because they have to weed through all the other stuff, and maybe by that time they’re perhaps not even into Dream Theater. So I’ll take these melodies and I’ll do this nice piano stuff, and then I’ll add things to it. I’d be able to put in my progressive touches. Even within the ballads I felt like I could wander a little bit and end up in a more progressive, aggressive zone and do something that’s a little bit more chops oriented or whatever, and then come back to the melody. And that was part of the plan, too. If I’m going to play the ballads and play what I think are really nice melodies, I have to stay somewhat true to the melodies and really let them be heard. What’s deceiving is that you could listen to an arrangement I did, like “Another Day” that starts out and you don’t know what it is if you don’t see the title. You’re listening and you’re going, “This is not a Dream Theater song.” [laughs] But eventually it wraps around and weaves and does some stuff, and then ah, the melody, and there it is and the song begins and I kind of play through it. So there were a lot of decisions to be made about the approach to the songs and to be true to it because I know a lot of Dream Theater fans would really be upset if I didn’t offer the melody [laughs] in a pretty clear way. So I think I offered it about as clearly as I could without being untrue to myself and what I wanted to do. MPc: I noticed a fun little oddity, or gem — I’m not sure what the right word is yet. I think it was in “Hollow Years,” you actually did a little ragtime piece in the middle of it. That was a fun and totally unexpected change. JR: There was a little bit of that touch, right. Was it that or was it “The Answer Lies Within?” I don’t remember, either. But yeah, I tried it. You know, I’m a big believer in offering elements that are a little bit lighter than the usual, more progressive or more serious fare, as you can tell by my various albums with Dream Theater. Especially in a group like Dream Theater, where it tends to be so serious. You’ve got all these riffs and all these rhythms and it’s very intense. It’s kind of demanding. In a way, we can take ourselves very seriously. But I like to lighten things up a little bit and make people smile and go, “Okay, this is kind of fun.” And I think for most people I find that those types of breaks really work well. For some people, they get offended that I’m trying to break the seriousness and could take a theme and turn it around and make it a honky-tonk thing or play some circus-y music in the middle of it. But I think for most and for myself, I like it. It feels right to me that okay, yes, we take ourselves seriously. We want to be virtuosos or whatever. But also, we’re all in this together and it’s fun. MPc: Did you record this all on a real acoustic piano, or did you use this as a challenge to see what the virtual instruments could really do as solo instruments? JR: Well, here’s what happened. I started out this project, and my intention was to do the whole thing on this wonderful Steinway piano that I have in my house. So I got my good mikes together and set it all up and began recording, and I actually recorded two songs on the Steinway. But there were a couple problems. I ended up not using the Steinway, and here’s why. Number one, I have a dog in the house that turned up on the tracks. Every time I would come to a very, very gentle passage, you’d hear the dog snoring! So after I realized that that was the issue, that the dog kept coming in the room, I tried to lock the dog out of the room by putting some barriers there. But the dog started to scratch on the barriers, and I couldn’t record because the mikes are really sensitive. So I put the dog on the other side of the house, and every time I started playing the piano, it would bark. [laughs] So I was having a bit of a real issue with that. It was hard. Or my cat would come running in, and you’d hear [sound effect] on the floor, which was really upsetting. The other thing was that I was trying to arrange these songs in a very particular way and really put a lot of thought into it. And what I didn’t feel like doing was taking pencil and paper out and doing an arrangement in that way. I’m more of a… I’m not an old-fashioned musician so much anymore. I work with my sequencer. I lay parts in. I see what they sound like. [laughs] I add another part. Just more like that. So I would sit at the piano, and between the dog and the cat and just playing something, I’d play this really nice thing that I loved so much and all of a sudden I’d maybe flub a little note, and I’d go, “No.” You have to start from the very beginning. And I’d do it again and I’d play along, and then I’d hit a note maybe a little bit too soft, and I’d go, “Oh, that’s not what I wanted to do.” I’ve got these ears now that have been so used to working with synthesizers and computers, and I just wanted this thing to be right. I wanted it to be true to my piano style, but at the same time I wanted it to be the artistic statement that I really want to make without any kind of fault. So I decided to do it in my studio after all. And beside that, what really capped it off is when I went to go back to the recordings — I recorded two songs. I think it was “The Spirit Carries On” and “The Silent Man.” When I went to go find those and perhaps use those on the album because they turned out well, the files were gone! I don’t know what happened to those files. I looked for a whole day through my hard drives, any kind of CDs where I might have put it. It just was gone. I couldn’t believe it. I still can’t believe it. It’s got to be in there somewhere, but it’s not. So between all that, I ended up working in my studio. And I’m very happy with the results because I did it all with Ivory, which is the program by Synthogy. And Ivory is a very, very satisfying program to play. MPc: Virtual pianos have really come a long way. JR: Yeah, there are so many piano programs out there and a lot of them are good, but the Ivory one stands out in my mind because it just feels right to play. It seems to resonate under my fingers. It is electronic, so you have to have the volume up and good speakers. But by the time it’s recorded, I feel that it’s such a great sound. To get that kind of a sound out of an acoustic piano, you’d have to have some amazing mikes and an incredible room and just an incredible recording technique. We’re at the point now in music technology where I really feel comfortable with putting out a piano album with a digital piano. So that’s what ended up happening. MPc: What controller did you use for the performance? JR: Well, that’s a good question. In my studio, the main controller in the middle of my speakers is still the Kurzweil 2600. Of course I use the Korg OASYS in my Dream Theater shows. It’s the main thing. At home, though, I’m still really comfortable using the Kurzweil as a controller because I like the action a lot. I like the Korg action, too, but the thing is that the Kurzweil, I’m really fond of the controllers. If I want to be able to quickly do something on a slider with the volume or expression or panning or controlling some kind of reverb, I find the Kurzweil design to be really very powerful and friendly. It does the right thing. It’s quick. I know it really well, so it functions for me. So that’s still my master controller in my home studio. JR: No, I’m not. It’s just one of these things when I was growing up and practicing the piano and learning pieces, I did a lot of pieces that were just left hand studies. Like Chopin etudes and Moszkowski etudes and a lot of intense exercises to make sure that my left hand could really work. And actually what I was thinking when I was playing, a lot of times I would think about Chopin when I was putting this together in the sense that… well, he’s my favorite composer for the piano, and especially things like his nocturnes where you have this left-hand movement that can be this constant flowing motion that can even have a wide spread, but it’s something that will flow underneath the melody that might be in the right hand. So the right hand can be very simple, just playing a melody, and the left hand is just constant eighth notes or something like that. And that’s an approach that I thought would work well on some of the music here because I wanted the melody to stand out, but I wanted it to flow. So I felt like there had to be some kind of tempo. So that whole Chopin approach of arpeggiating the chord in the left hand really seemed to work very well, and I used that quite a bit to make things feel and sound right. MPc: Did you record any of the songs to a click track, or did you play it all by feel? JR: No click track. Yeah, just totally loose. MPc: How long did it take you to record Notes on a Dream? JR: Well, I would say it took about a month of working to get it all where I wanted it to be, but I did it over a longer period of time, over the course of a few months in my time off. MPc: And then you still had to find time to make a new Dream Theater album and get ready for a new world tour! JR: Yeah. Well, now I’m really working hard or cramming, I guess you could say, to get ready for this tour. There’s a lot of challenges, as there always are, trying to figure out how to do what I did in the studio, how to make that happen live. And also there’s a lot of surprises that are coming up on the next tour, like things with my rig, that are pretty interesting. For instance, I just got this cool box that a friend of mine made me in Korea that can send MIDI messages out with the movement of my stand. I guess I shouldn’t give away the entire thing, but I can give some hints about some of the coolness. So I’ve got this little contraption that as I move my rotating stand, it actually sends out a message. It’s like a little compass. So that controls some cool effects in my rig. I worked with our 3D designer. 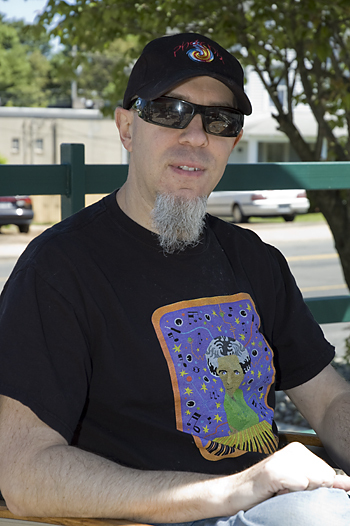 Dream Theater has this really cool guy who does a lot of images for us. His name is Robert Medina, and he’s from Australia, and he’s done this amazing three-dimensional keyboard wizard character. MPc: I was just going to ask, when we saw your Muse Research performance at NAMM, you had a… a virtual Jordan! JR: Right. That was a beta version of the virtual Jordan. JR: So that’s what we can expect in the next tour. It’s going to be really, really cool. So I’ll kind of have that little friend along with me, so you’ll have to keep your eyes open for that. So just trying to organize that and test the equipment that that’s going to run on. And there’s a lot of technical work. And it’s funny, when I’m preparing the stuff, well, first of all there’s a lot of stages to my preparation. Number one is going into all the songs and figuring out what synthesizers I used and then deciding on how I’m going to take all those sounds from all those synthesizers and make them sound on the gear that actually comes with me live. And that’s done in a lot of different ways. Some of it’s just programming the OASYS or my [Roland] V-Synth to do what I need it to do. Some of it is more like a sampling kind of thing. I did a lot of sampling of certain sounds that I wanted. I used a lot of the Spectrasonics program called Omnisphere on the album, and I sampled a bunch of that just to get it inside the OASYS so I’d have those sounds. Getting all that together. The special effects, like spoken word things, thunderstorms, all the different things that we have going on on the album are also inside the keyboard. [laughs] It’s insane! So a lot of time was just spent getting everything I need into that keyboard. And right now my OASYS is stocked so full of cool stuff, it’s really kind of funny. I just love standing in front of it, knowing all the sounds that are in there. If the OASYS was sold with all the sounds that are in it now, it would like [laughs]… it could rule the world. 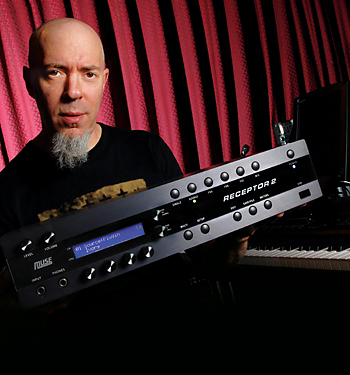 MPc: You would make some Dream Theater fan very, very happy. JR: Oh, it’s unbelievable. I have the most incredible Mellotron collection in there. Just turn it on and load the samples and it’s all in there — all the sounds that I need for my gig to date, of all the Dream Theater music I’ve played, all the Mellotrons, all the organs, all the leads, all the stuff, it’s all inside of the OASYS. It’s a goldmine of progressive rock keyboard sounds and beyond. MPc: So I guess it’s safe to say that the OASYS has withstood your long-term road test, as it were, in terms of not being just another passing, fleeting piece of gear. JR: Yeah. I’m so happy about that. It was really, really important. My life is definitely easier with the OASYS than it was before that with the Kurzweil, even though the Kurzweil 2600 that I used was an incredible instrument and still to this day is. The reason it’s so much easier for me now is: number one, I can get many more samples inside the OASYS, so that’s why the OASYS can live this long, because I’m making all these new sounds, doing all these new things, even with new technology, but still it’s samples, so you can record anything and get it in there and put it on a key. So that whole technology is still very valid to this day for what I do with the band, for sure. The other thing is that with the Kurzweil, every time we changed the set, it was such a big pain. It was unbelievable. My tech and I, or just myself, would sit backstage before a show and just try to figure out how to get the samples I needed for the different songs because it just wasn’t a system that would easily allow you to load in what you need. I’d have to do all this stuff with the disk drive and load some things in and leave some things out and figure out where they were and how to squeeze it in. It was a puzzle every night to try to do this. With the Korg OASYS, I’ve got one set of programs. I literally save my whole program and sample file — that’s one file. And then all the songs use that program and sample file. They all access the same programs. If I need to make a new program, like, if I need to sample your voice or something like that, I’ll do that and I’ll save that as part of the program file. And then each song that I do is a separate file, and it’s really easy to bang every song in a particular night’s set into there. And they’re all calling upon the same program file, and it makes it really, really easy. I put all my sounds in order, and I just go. I start the night on zero, and I end the night on whatever the last sound is for all the songs that we’re playing, and every night it’s pretty easy to put the set together. So the OASYS has held up very well. It’s a very reliable—and I’m not just saying this — it’s a very reliable, sturdy, strong keyboard. For all that it does, it’s made so well for the road. My biggest disappointment is actually that they stopped making it and that it’s not… I don’t think the plan is for it to really go further. The OASYS has so many things going for it. The effect section alone on that instrument is an incredible beast. It’s massive. You can really do so much. There’s twelve insert effects. There’s two master effects. There’s two multi effects. I can have my Hammond organ going through the rotary speaker. I can have my strings going through a nice reverb. I can have brass going through all this advanced EQ going through dynamics processors. Everything can happen. The biggest drawback of the OASYS is that they never brought the instrument to a point where I could be playing one big combination sound and then be able to switch to the next sound without it interrupting the sound. Korg is pretty aware of that. They know that that’s an issue. But it’s such a system rebuild that there’s not a whole lot they can do beside take a few steps back and do something else. MPc: It’s one thing to have reverb and delay tails morph into a new effect, but with the OASYS you’ve got multiple different synthesizer engines that it needs to morph from one thing into another. JR: Yeah. Well, the Roland Phantom G is an instrument that I was very involved with, and it’s kind of coming into the universe. And one of the things that I pushed for was the ability to be able to hold what they call a Performance. Korg calls it a Combination. To be able to hold a sound, switch to the next and still have that sound. They have a really different approach. What they do is something like: you’re playing one sound and it uses a certain number of voices. When you switch to the next patch, the next performance, it’s actually using completely different voices. It’s kind of like swapping between the synthesizers, if you will. They almost have voices in reserve. So you’re never going over the ones that you’re using, so it’s really, really cool. But their live performance mode, which this works in, this idea, is an eight-part mode, so you can have eight different sounds at the same time and then switch to another eight-part mode. And all eight sounds can have their own dedicated effect to them. On the Korg, it’s a 16-part situation. Sixteen parts makes for a lot of flexibility, and with all the effects, in many ways it’s more powerful. I don’t know. Somehow somebody’s got to make me something that [laughs] is really right. MPc: As the processing power just keeps increasing, eventually there won’t be any limitation on the number of voices that can happen concurrently. JR: Right. Absolutely. That part I think they’ve got. Some of the software, even [Apple Computer’s Logic] Main Stage and stuff like that, it can do a lot of things that you can’t do with some of this hardware. But the biggest problem for me with switching to something like Main Stage is that—think about it. Over the course of a night, I’m playing in rapid succession so many different sounds. Strings, brass, choirs, percussion, sound effects, pianos, all this stuff is bang, bang, bang, bang, bang, bang without stopping. You finish a song, it’s one, two, three, four and you’re on to the next song, or not even that much time. So all the software companies are making great stuff, but the problem for live is that you still need time at some point to bring those sounds in because they can’t—all the sounds I need are not going to live inside whatever it is I’m using. [laughs] The workstations are designed — even though they’re not using samples that are as grandiose, as big, they’re still designed so that you can bang through them. So that’s why I feel like the workstation concept is still something that really works for me in what I do. Photo courtesy of Muse Research. MPc: Will you be taking Receptors on the road? JR: My plan is to take the [Muse Research] Receptor. I’m not quite sure how it’s going to work out. As I mentioned, I used a lot of the Spectrasonics Omnisphere on this album, and so I wanted to just run all that off the Receptor, and I think the Muse guys are very close to having the receptor working with Omnisphere. But as of this day when we’re doing this interview, it’s not there yet, and as you know I’m hitting the road really soon. So I’ve had to take a slightly different path. When they get that working, then I’ll see where I’m at with my tour and figure out what I’m going to do. MPc: Give us some of your thoughts about the new album. JR: Well, where do I begin? I’m really pleased with this new album. I think it’s a really great Dream Theater record. These Dream Theater records are such an interesting process because they tend to happen very fast, in a way. Mostly in the sense that we go in there, we set up, we do our thing, and the next thing you know we have all these tunes that are written. Because the tunes really don’t take a — if you can call them tunes — the tunes don’t really take us very long to put together. We’ll bang out one of our DT epics in the course of a week, three days, four days, something like that. It will be pretty much done. Not recorded, but the music will be written. We will have decided on the parts, how they all go together, and then we can start recording and Mike can start to do his drum tracks. So it’s really a whirlwind. And what always happens is by the time the album is tracked and I go to start learning what we did, and I start listening to it, I always feel the same way. Like, “Oh my god, how did this all come together like this?” It’s so crazy that it came together — it always seems like it just came together so fast. And a lot of the musical ideas and compositional things are just spur of the moment. We’re just in the studio. John Petrucci plays a riff, and we go, “That’s nice. How about this?” And we put it down, and then we say, “Okay, that’s great,” and we move on and we do the next section. And the next time I might hear that riff is when we’re tracking and then again when I’m going to learn it. So it’s kind of like there’s a little bit of magic to the process, as there is a little bit of magic in music. And the inspiration comes from who knows where, and this album is very much about that. Of course, there’s so much work involved with making an album. And one of the things that I think is really interesting about this album, and I think really shows, is that this band has been together, as you know, for a long time and there’s a lot of experience. Experience on many levels. Experience making albums. Experience writing music. Experience playing live shows. We know what our fans appreciate. We know what feels right to us. And even beyond that, John Petrucci knows more about how to get a really good guitar sound now than he ever did before. Things like… we work with Paul Northfield, who is our engineer and mixer for this album, and he’s worked with us before so he knows our parameters. He knows how to work with us. And he was more free and felt more comfortable just getting what he needed to have a successful album out of us. The first time, he was tiptoeing a little bit, a little bit more I should say, because he didn’t know us. He comes in and it’s a new thing for everybody. But this time it’s not. We’re old friends, and he was totally there with us, doing this. So that really helped. So in every level, the sonic quality is really at the next level. You’d expect that to some extent with technology, but I think because of a lot of parameters, even beyond the usual stuff, it’s come together a lot. And from a personal point of view, just the keyboard world, every year I kind of build up this sound library, especially if I can maintain some of the tools that I use, like the Korg OASYS. So I have all these cool sounds that even though I have to do a lot of programming, still a lot of times it’s like, “Oh, you know what? That sound you created, the one you used in ‘Panic Attack’ or the sound from ‘Beyond This Life,’ that’s the one that would really work.” So I’ve got this cool library that keeps on getting bigger and better, and I keep adding to it. So every year when I’m tracking, it’s kind of more fun. MPc: In talking about Black Clouds & Silver Linings, I just saw the “A Rite of Passage” video. That was the closest thing to a traditional metal single I can recall seeing or hearing from Dream Theater. JR: You know what? I think our “Constant Motion” video was very similar to that. The Roadrunner thing — that’s of course the record company — has been really, really great. They’ve been… in my time with the band, in ten years Roadrunner’s been the most supportive and the most active in really advancing our career and working with us, which is fantastic. But one thing that’s of interest is that when it comes time to really do some very focused marketing, the marketing is geared towards the metal side of things. And that’s a part of Dream Theater, that more metal, pop side. Of course, Dream Theater is much broader than that. There’s a lot more to it. And the part that’s a lot more to it is all the parts that have a lot of keyboards. So the actual metal thing, even though there’s definitely sounds and contributions that I make, it’s not the most visible part of what Jordan Rudess does with the band. So I know when we’re going to do these commercial videos that that keyboards, unfortunately for me, are not going to play a big role. Like, for instance we did the “A Rite of Passage” video that I think is a really great video. I’m proud of the fact that Dream Theater has a really cool video. I think it looks better than any video at least that I’ve ever done with them. But, what happened was I did a pretty cool keyboard solo in that song. I did a bunch of good parts, but they’re not even in there! The thing is, if you’re going to have a commercial rock song that has to be a certain amount of time, you want to pick the particular elements. You want to pick the verse, the chorus. You want to have the guitar lead. [laughs] And there’s a lot more to the song, but a lot of it got cut. MPc: Oh, so there’s more to look forward to on the album version of the song! So that’s really wild and crazy. And of course there’s people like — that opens up the gates for all this online discussion about the thing. Some people love it; some people hate it. “Oh my god, Jordan, you’re using this great technology. It’s so cool that you’re cutting edge.” On the other side, “Oh my god, why did you use this sound?” [laughs] It’s actually funny. JR: Yeah, right. That would be nice. MPc: You’ve been so busy lately. We recently noticed that you played a few tracks on Steven Wilson’s solo album, Insurgentes.